Heat profile in an air-cooled cylindrical lithium-ion battery battery pack. The thermal model is coupled to electrochemical reactions and ion flow, which act as a heat source. Batteries and fuel cells are being asked to perform in more challenging environments, with greater energy densities or power efficiencies, over longer lifetimes. These requirements are placing more pressure on these industries, and modeling and simulation is fast becoming one of the necessary tools for developing, designing, optimizing, and ensuring quality and safety of batteries and fuel cells during operation. Examples of systems that may be studied include lead-acid batteries, lithium-ion batteries, nickel metal-hydride batteries, solid oxide fuel cells (SOFCs), direct-methanol fuel cells (DMFCs), and proton exchange membrane fuel cells (PEMFCs). The Batteries & Fuel Cells Module models the underlying electrochemical behavior in the electrodes and electrolytes of batteries and fuel cells. It allows you to investigate their performance for different operating conditions, design configurations, and deterioration due to different aging mechanisms. 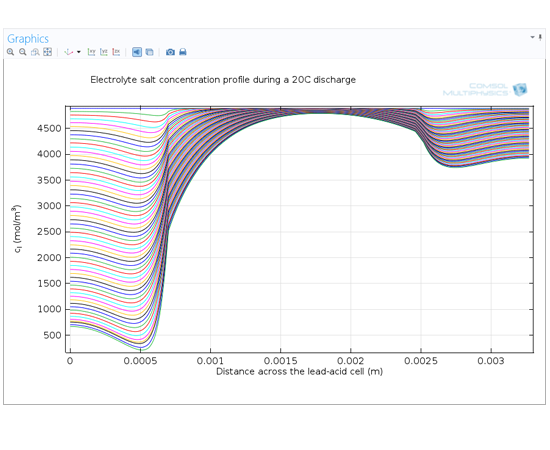 With this add-on module, you can simulate characteristics such as the transport of charged and neutral species, current conduction, fluid flow, heat transfer, and the nature and driving forces of electrochemical reactions at planar and in porous electrodes. Using this understanding of these characteristics, you can design and optimize the geometries and material choices of your system's electrodes, separators, membranes, electrolyte, and current collectors and feeders with respect to performance, thermal management, and safety. Temperature field in a lithium-ion battery pack for automotive applications. 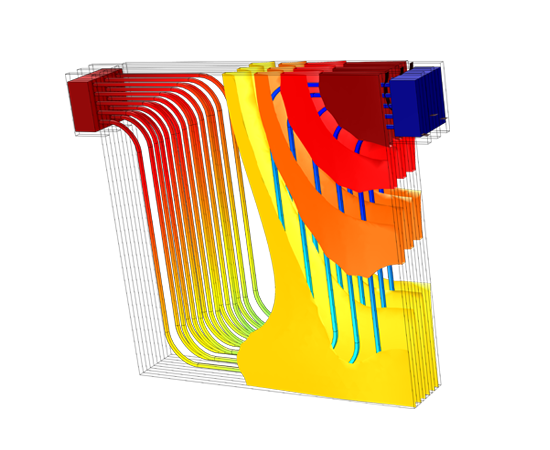 Shown here are the temperature isosurfaces and temperature profile on the fluid flow in the cooling channels. Oxygen and fuel concentration distributions in the channels and the gas diffusion electrodes of a proton exchange membrane fuel cell (PEMFC). Flow and pressure drop through a fuel cell stack. Electrolyte salt concentration during a 20 C discharge in a lead-acid battery. The Intercalating Material feature in the Lithium-Ion Battery interface is used here to describe two different intercalating materials in the negative electrode. The battery performance during discharge for different mix fractions of the two intercalating materials in the negative electrode is studied. Electrochemical Impedance Spectroscopy (EIS) study of a fully-modeled 3D solid oxide fuel cell (SOFC). The curves increase in scope as the difference between the two exchange current densities increases. If you're starting from scratch with your model of a new design, or even of a battery or fuel cell that has been deployed to your application, you should start off simple, and then add complexity to your modeling. Usually, this means investigating the characteristics of the device through a primary current distribution model. This simplifies the electrochemical reaction, electrolyte, and other components by describing it as conductors with resistances, utilizing Ohm's law. Primary current distribution models provide a lot of feedback about your device's geometry, and can be used to receive indications on its thermal management and even its structural integrity due to thermal expansions. The Batteries & Fuel Cells Module contains specific interfaces within the COMSOL Desktop® graphical user interface (GUI) for a large number of physics formulations. Known as Physics interfaces, the Primary Current Distribution interface contains appropriate fields for specifying material properties, like the conductivity of electrodes and electrolyte, for all the different components in your battery or fuel cell design. Furthermore, it is easily coupled with the physics interfaces that describe other characteristics, such as Joule heating or the analysis of thermal stresses, that may exist within the Batteries & Fuel Cells Module, COMSOL Multiphysics, or one of the other physics-based modules. Once the electrochemical kinetics have been established, you can involve them in investigations of your batteries and fuel cells through secondary current distribution models. In these models, electrochemical reactions are directly affected by the charge transfer mechanism and the activation overpotentials. Such models give a better indication of the operating voltages and currents of your system and are useful in deciding electrode and electrocatalyst materials, while allowing you to include activation overpotential losses within any thermal study you may perform. In addition, the Secondary Current Distribution interface can be fully coupled with the Chemical Species Transport interfaces that describe the transport of species in the gas pores, in gas diffusion electrodes (GDEs), for instance. In the description of GDEs, the transport of dissolved gases in the pore electrolyte and their transport to the active sites can be accounted for using agglomerate models or thin film models. The transport of gas in the pores is then also coupled to the transport and flow in the gas channel, for example in fuel cell bipolar plates. Homogeneous reactions can be accounted for by using kinetic expressions in the Mass Transfer interface in the Batteries & Fuel Cells Module, where arbitrary sink and source terms can be defined. Alternatively, they can be defined in the physics interfaces in the Chemical Reaction Engineering Module and coupled to your battery or fuel cell model. Yet, the previous types of models assume that concentration is constant throughout the electrolyte, and that current transport only occurs through ionic migration, which is patently not true. One of the important factors driving an electrochemical reaction is the electrolyte composition in the vicinity of the reacting sites. To really investigate the electrochemical characteristics of a battery and fuel cell, a tertiary distribution study may be required. This takes into consideration the variation in concentration and should include a good description of the material balances and transport in the electrolyte. Also for tertiary current distribution, the composition of the electrolyte and pore electrolyte may be fully coupled with the material balances in the gas phase and in the gas pores in porous electrodes and GDEs. These descriptions can also include the transport of species through the pore electrolyte using agglomerate and thin film models. In the case of batteries, specific intercalation equations are also incorporated, to account for the transport in electrode particles. Materials in separators and electrodes may also react in homogeneous reactions, resulting in deterioration of performance. The Chemical Species Transport interfaces enable you to model the chemical reactions of these materials for estimating the effect of aging of the cell materials may have on battery and fuel cell performance. The conduction of electric current in the electrodes and in the current collectors is described using Ohm's law, in combination with the equations for current conservation. This accounts for the resistive losses in electronic conductors, like current collectors and feeders, electrodes, porous electrodes, and GDEs. Current collectors and feeders can also be modeled using thin conductive layers, also called shells, in order to avoid meshing along the thickness of these thin layers. The current balances in the electronic conductors can be coupled to the current balances in the electrolyte and pore electrolyte through the charge transfer reactions using the dedicated electrode interfaces. Models developed in the Batteries and Fuel Cells Module may also be integrated with physics interfaces in any of the other modules in the COMSOL Product Suite. Via such integration, you may uncover critical information concerning the design and operation of current collectors and feeders, cooling systems, the optimization of electrodes, separators and membranes, and thermal management, with respect to performance and the deterioration of components due to aging. Fluid Flow interfaces from the the CFD Module or the Heat Transfer Module, which support the simulation of turbulent flow, can be utilized in modeling the heating and cooling systems of lithium-ion batteries, or high temperature fuel cells, such as the MCFC and the SOFC. These may also require formulations for surface-to-surface radiation, which is supported by the Heat Transfer Module. Parameter estimation from electrochemical impedance spectroscopy (EIS or AC impedance spectroscopy), voltammetry, and current interruption simulations and experiments can be done in conjunction with the Optimization Module. One interesting coupling for modeling the aging of electrodes is the inclusion of the structural stresses induced by changes in density during charge and discharge in the electrodes. These stresses can be used to estimate the extent of micro-fractures in the electrode particles, which result in loss of electric conductivity that deteriorates the performance of the electrode. 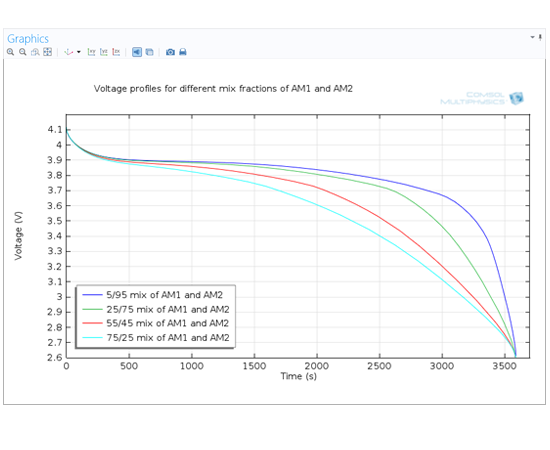 The Batteries & Fuel Cells Module is the only simulation software that can be used freely for modeling all types of fuel cells and batteries, with the most robust features for simulating all varieties of electrochemical behavior. Contained within the product are a number of physics interfaces that simulate either the electrochemical processes themselves, or the surrounding processes that affect them. The reacting species of batteries and fuel cells can exist and then be transferred to a variety of different states and phases. This includes existing as gases, liquids and solids, in concentrated and dilute electrolytes, mixtures and solid-state solutions. The Batteries & Fuel Cells Module interfaces for material transport model the transport of chemical species through a variety of both free and porous media. This includes the diffusion, convection, and migration in dilute and concentrated solutions and mixtures, in planar, porous electrodes, and GDEs. Migration is an available term in all the physics interfaces, which is accounted for in the Tertiary Current Distribution interface by the Nernst-Planck Equations interface. Material transport is also described in physics interfaces for modeling lithium-ion batteries, lead-acid batteries, and binary electrolyte batteries, in ways specific to these electrolytes. A specific Reacting Flow interface is also available for modeling chemical species transport directly coupled to flow and chemical reactions. As with all the modules in the COMSOL Product Suite, you can define any equation you like in the edit fields within the physics interfaces and have them be dependent on any of the variables within your modeled system. When this is done for electrochemical charge transfer reactions, the kinetics expressions can be arbitrary functions of the chemical species' concentrations, temperature, and the local electrode and electrolyte potentials at the electrode-electrolyte interface. The Batteries & Fuel Cells Module provides predefined physics interfaces that help in the definitions of these kinetics. This includes the Electroanalysis interfaces, which are specifically useful for modeling applications like AC Impedance. 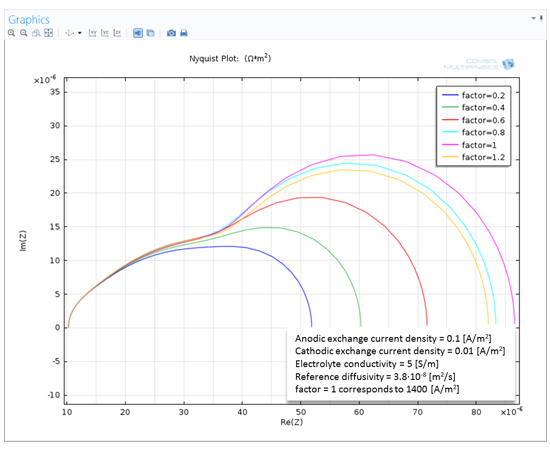 In the Secondary and Tertiary Current Distribution interfaces, edit fields are available for the electrode kinetic parameters of equilibrium potential, anodic and cathodic charge transfer coefficients, exchange current density, the symmetry factor, and stoichiometry. Predefined expressions are also available for Butler-Volmer and Tafel expressions. In the Tertiary Current Distribution interface, the local concentration of the electroactive species is included in the reaction expressions by using the variables for the concentration. Porous electrodes and GDEs are also catered to in these physics interfaces, where the effective electrolyte and electrode conductivities can be specified along with anisotropic behavior. The practical purpose of batteries and fuel cells is to facilitate the conversion of chemical energy to electrical energy, and vice versa (in the case of batteries). Losses in this conversion should be as small as possible and aging should also be kept to a minimum. To be used for design and optimization, simulations often have to include the effects of ion transport in the electrolyte, membranes and porous electrodes, and the electron conduction in the electrodes, all in combination with the conservation of current and charge. The Primary and Secondary Current Distribution interfaces assume that ions move only through the effects of the electric field, neglecting diffusion, although they can still include approximative analytical expressions for concentration overpotential in porous electrodes. The Secondary Current density interface can also be fully coupled to gas phase transport, using the Maxwell-Stefan equations, in the pores in gas diffusion electrodes. This includes the diffusion of dissolved species in the pore electrolyte between the gas pore and the active sites, using agglomerate models or thin film models. The Tertiary Current Distribution interface considers the transport of ions through the contributions from all three material transport processes: diffusion, convection, and migration through the Nernst-Planck equations. All these contributions are therefore included in the formulations that describe the current density, though convection is usually cancelled out by electroneutrality. This formulation is also coupled to the charge transfer reactions at the electrode-electrolyte interface, and provides you with results for cell voltage as it relates to the cell current for stationary, transient, and frequency domain (EIS) analyses. The conduction of electric current in the electrodes and in the current collectors is described using Ohm's law in combination with the equations for current conservation, including electric conduction in porous electrodes and GDEs. An interface that simplifies the modeling of current conduction in thin current collectors and feeders, using thin layers (shells) without having to mesh them, is also included in the Batteries & Fuel Cells Module. Electronic conducting particles, fibers, or filaments can also be included inside a cell to simulate the effects of short circuiting and thermal runaway in batteries. Specific physics interfaces have been included in the Batteries & Fuel Cells Module for modeling lithium-ion batteries. This includes extra terms and formulations to describe internal particle diffusion (intercalation) and the solid-electrolyte interface (SEI) as having a thickness and included as a model variable. The growth of the SEI during operation and under different operating conditions can be modeled to simulate aging. The Lead-Acid Battery interface is also provided, where it additionally considers porosity variation in the electrodes, due to the charging and discharging of the battery, and the average superficial velocity of the electrolyte caused by this change in porosity. Binary electrolyte batteries are best modeled within their specific physics interface, as it considers concentrated electrolytes and the constraints that electroneutrality places on the transport of ions in such systems, as well as the intercalation of species in the particles that form the porous electrodes. This physics interface is useful for modeling the nickel-metal hydride and the nickel-cadmium batteries. Laminar and porous media fluid flow are accounted for in the Batteries & Fuel Cells Module in physics interfaces that solve the Navier-Stokes equations, Darcy's Law, and the Brinkman Equations. You can account for turbulent and two-phase flow by including Fluid Flow interfaces from the CFD Module in your simulations. The Batteries & Fuel Cells Module features physics interfaces for modeling heat transfer through convection, conduction, and thermal diffusion due to the action of ionic migration. A specific interface for Joule heating that also includes the contributions of the activation losses is available along with one for modeling heat transfer through porous media. This takes into account the different conductivities in the solid and fluid phases, along with the convective thermal dispersion that occurs in this type of media. 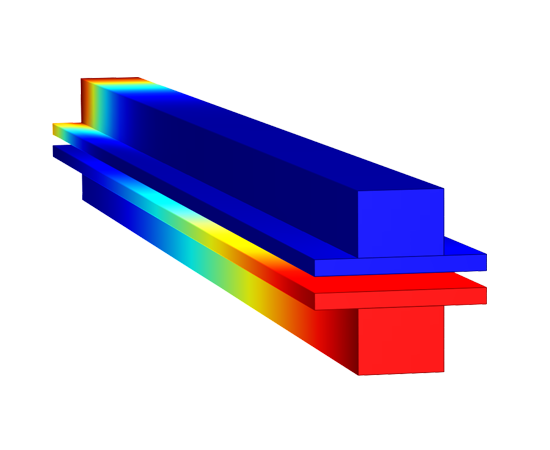 Surface-to-surface radiation can be accounted for in high temperature systems by coupling your models to physics interfaces in the Heat Transfer Module. The following example is a 2D tutorial model of a lithium-ion battery. The cell geometry is not based on a real application; it is only meant to demonstrate a 2D model setup. 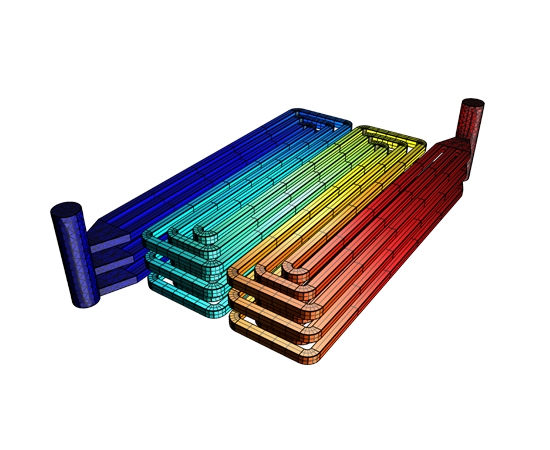 This model simulates a temperature profile in a number of cells and cooling fins in a liquid-cooled battery pack. The model solves in 3D and for an operational point during a load cycle. A full 1D electrochemical model for the lithium battery calculates the average heat source.